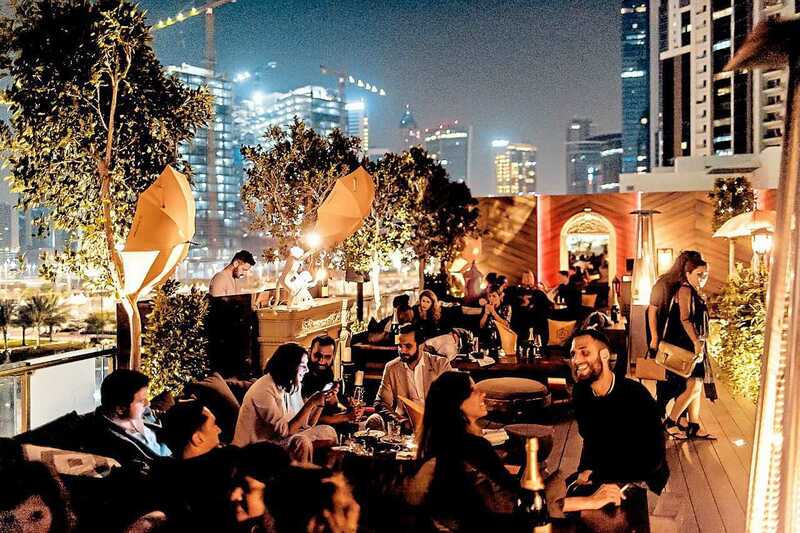 The chic DIFC haunt is perfect for those looking to grab a quality bite to eat – the venue is known for specialising in not one but seven international cuisines; Italy, Mexico, Spain, India, Bali, Britain and the Middle East – whilst unwinding over some drinks and shisha. The uninterrupted views of Downtown Dubai aren’t bad either. As the name suggests, the Sunken Garden offers its guests a calm, quiet hub in which to enjoy their hubbly flavour of choice. Aside from having 30 shisha flavours to choose from (the mango tango is great for those looking to try something different), the venue is also home to a number of great hot and cold light bites (the beef short rib cromesquis is a must) as well as a number of thirst quenching mixes and blends. With an ambiance and décor that would please Jay Gatsby himself, Noir is the spot for those looking to experience the “finer things in life”. Aside from shisha (only available to those who opt for outdoor seating), the venue’s extensive list of premium blends, cigars and food (the gratinated chupe de javia, crab meat covered with cheese and white sauce, is to die for) is well-worth a try. This is one of the oldest shisha spots in the city, known for its extensive hookah menu, Creekside location and always buzzing vibe. The uninterrupted views of the Burj Khalifa and the deep house beats spun by a number of guest DJs aren’t bad either. Treehouse’s chic all white interiors, stunning views of Downtown Dubai and always buzzing ambiance makes for a great date night location or trendy hangout spot with friends. DJ Taylor will have you involuntarily swaying while the venue’s “MediterrAsian” dishes will keep your hunger at bay. Be sure to book or get there early because it gets pretty busy after 9pm. If you’re looking to unwind over drinks, a decent meal and some shisha, this is the place for you. While it may have a beachside location, its menu is quite diverse. There’s a variety of seafood options, burgers, quesadillas and a “from the grill” section. Home to stunning uninterrupted panoramic views of the Burj Al Arab, 360˚ is perfect for those looking for an upbeat evening. Aside from its extensive hookah offering, the venue’s Pan-Asian cuisine is well-worth a mention. As is its daily, three hour happy hour. From 5pm to 8pm, guests receive up to 50 percent off on select hops, grapes and house beverags. If you get to the pool side venue located in The Address Dubai Marina between the hours of 6pm and 8pm, you will receive 50 percent off on a number of select house beverages and signature drinks (the Sunset Shades offer is on from 6pm to 8pm, daily). The live weekend entertainment and city skyline views are a nice added touch.